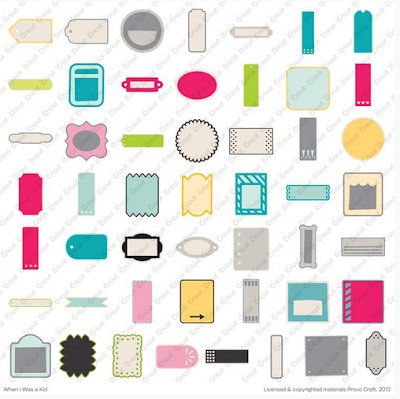 Another new Cricut cartridge filled with 50 more layouts was just announced. 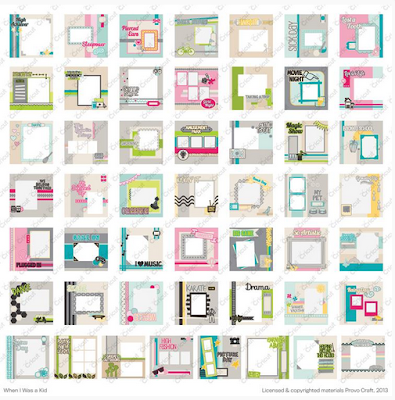 Last month I told you about The First Few Years cartridge (see the post HERE) which includes 50 full page layouts for typical scrapbook pages for babies and toddlers. The next cartridge, When I Was A Kid, has 50 more layouts that cover the next stages of a child's development. If you are curious about this new type of cartridge - here is some good news. 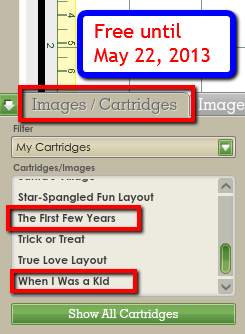 Until May 22, 2013, you can access both of these full cartridges through the Cricut Craft Room for free. When you log in to the Cricut Craft Room you should see both of these cartridges listed under "My Cartridges" in the Images/Cartridges tab. I noticed a few other free layouts in my account when I took this screen shot - I am not sure how long they will be there. Even though these layouts are set up for typical childhood topics, the basic sketch could also be used for other types of pages by simply changing the title and swapping out some shapes as needed. The handbook pages are labelled with the sizes you need to cut each shape for a 12 inch layout. 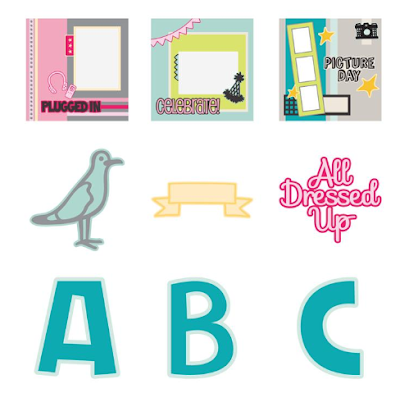 You will definitely want to download the handbook to use while working with the digital cartridge in the Craft Room. You can find the download link for the handbook on the cartridge information page HERE (click on the tab that says "Details"). 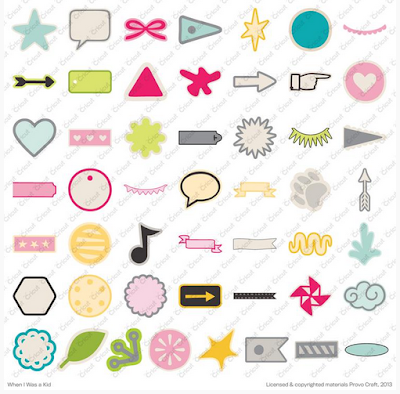 While some of the shapes are child specific, there are quite a few that would be generally useful for all ages. These shapes are even more multipurpose than the first group. I particularly like some of the journal/title blocks. 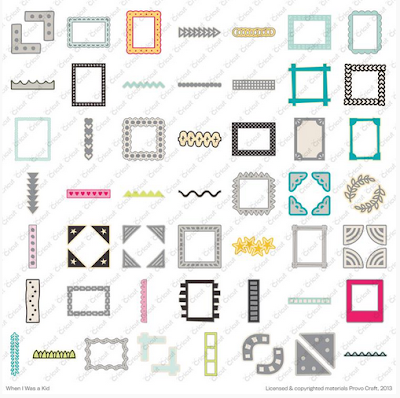 Some of these frames and corners would be great for cards. The titles and the font are definitely aimed at child pages but you might be able to use them in other situations. I've been doing the Layout A Day challenge this month. For a variety of reasons, I am doing my pages digitally. Sometimes I start with a blank page, but I also use page templates to help speed things up. Usually I change a few things, or many things, but it is good to have a place to start. These cartridges are appealing if you want to make pages quickly because they take things a step beyond using a sketch. You can simply cut all of the pieces for the page and assemble it as shown in the book. 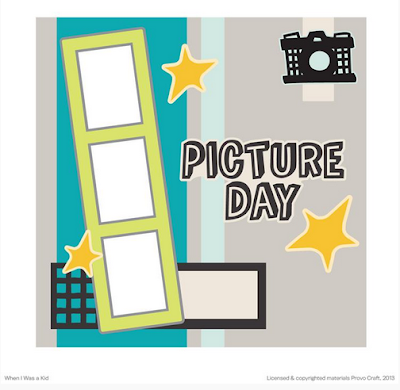 I did notice that most of the pages have only one photo spot but it is usually large so you could do a collage of photos in that space (I usually like to put lots of photos on a page). You can also treat the page as a starting point and rearrange things a bit to add the photos you want to use. One more reminder - if you are a Gypsy owner who received the $20 credit when Gypsy linking with the Craft Room became available last month, TODAY is the last day to use that credit. The credit is for digital images and cartridges only. You will find the code number under "My Account" - "Gift Card/Store Credit." When you are checking out, you will apply the gift card/credit on the second page (it is not a promo code to enter on the first page of the checkout). I did notice that there are a few digital cartridges for only $14.99 on the Today's Deals page HERE. If I can get my computer and the Craft Room to play nicely together, I may be trying out a few of these pages this weekend. I have been suffering with some combination of allergies and/or a Spring cold this week. The LOAD pages are getting done but I haven't had the energy to post every day on the blog. I am starting to feel a bit better so things should be back to normal soon. What do you think about these cartridges? Are you going to give them a try? I'm with you, Diane. I like to put a lot of pictures on a page. Plus I do mine in the 8 1/2 by 11 format so these carts wouldn't work for me. I wouldn't mind trying to cut out some of the other elements if I have time before May 22. I wish I'd known about the freebie sooner. Hi Bobby - I just got the email from Cricut last night so I posted as soon as I found out. They usually do these things just for a short time to get people interested - good strategy for them. I am sure that you could use the elements and rearrange slightly to do 8 1/2 x 11 pages. If you look at the handbook you can get a better idea of whether you could just shift things a bit or have to change some sizes. There are some really nice frames and mats that would work and the titles and images would adapt so I hope you have a chance to try a few pages while they are still free. I love this cartridge! 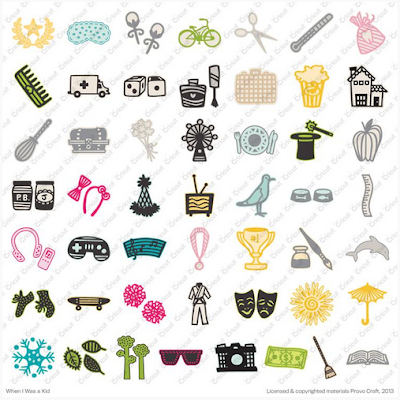 I saw it yesterday in an email, but couldn't find it on the cricut.com site. I have my 'puter and CCR working perfectly together and love it! Hi Jann, The links in my post should work. 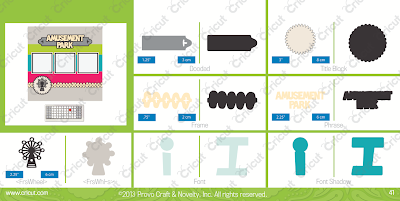 I talked to a friend today who said that earlier in the day yesterday the cartridge wasn't listed on the Cricut site. They send the emails out in batches so I guess mine came late enough that it had been added to the site by the time I knew enough to look for it. Definitely download the handbook or it will be difficult to make sense of how to lay out the pieces. I spent some time on the phone with customer service today and can finally open the Craft Room on my new lap top - I'll try cutting something this weekend in between all of the other things we need to do! I hope you get to make some great pages! Thanks for the tip about the $20 expiring tonight. I didn't even realize I had a credit, but after reading your post, I went and looked for it and it was there!! I tried to buy a cartridge with it, but the credit wouldn't work. I called support and they told me it was for digital content only, not cartridges. Thanks again! I love free money! I am happy that you were able to have a nice surprise with the "found money" - always fun to discover some spending money! You could buy only digital cartridges or images, not physical cartridges. I got the digital cartridge "Life's a Party" with my credit last month but hadn't been able to get the Craft Room to cooperate with my new laptop. After some extended troubleshooting with Customer Service today it looks like I can try out some cuts this weekend. What did you end up getting with your credit? I got Groovy Times for $14.99 then I got five individual images from Cindy Loo. I did have one problem, though. When I synched up my Gypsy (which I prefer to CCR) only the Groovy Times loaded. I can't seem to get the individual images from Cindy Loo on the Gypsy. I emailed their customer service people and hopefully they'll be able to straighten it out for me. LOL I too didn't realize I have a $20 credit. Thanks for your post - completely forgot about that. I haven't been on the Cricut MB in like months! I got the Sugar and Spice Lite digital cartridge because I've always wanted it but it is hard to get - eventhough I haven't used my Gypsy and Cricut much since getting the Cameo a year and a half ago. It's my hoarding nature, I guess ;).